Daralee has added a new article about Louis Schorn to her Olive Through the Ages website. There will be a rally to save Triangle Park and the old Main Street Library in Downtown Huntington Beach this Sunday, Oct. 4, at 2pm. There's another article in the Register today about the closing of Lorson's Books in Fullerton. The Register also features an article about the Bradford House in Placentia, and how items of historical interest turn up in the darnedest places. Orange, Golden Bear, Dreger Clock, videos, etc. Dell has delayed the shipping date for my new computer three times now. So I still can't edit photos, which explains why I'm just posting whatever's handy. 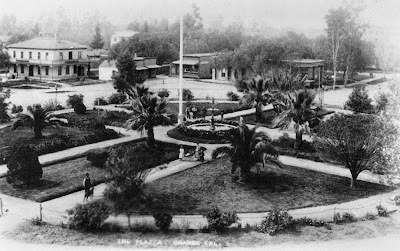 Today's images show the Plaza in Downtown Orange. The image above is from about 1895 and appeared on the cover of Phil Brigandi's last book. The image below is from 1887 and is a view looking east. The Register's website now features a slideshow from the recent Golden Bear reunion in Huntington Beach. They also ran a good story about the final leg of Glenn Frank's Dreger Clock restoration project. First of all, you can see the airplane crash that killed noted O.C. aviator/stuntman Paul Mantz. No, we don't see any gore, thank God. Just a plane in a lot of trouble. Huell Howser's visit to historic Anaheim (with Cynthia Ward as tour guide) has also been posted to YouTube as a six-part series. Here are links to the various segments: Part 1, Part 2, Part 3, Part 4, Part 5, Part 6. The "Great Park" people have also posted some snippets from oral histories conducted by CSUF's Center for Oral & Public History as part of their MCAS El Toro project. There's also a funky mini-documentary about Tim Rush of the Santa Ana Historial Preservation Society. 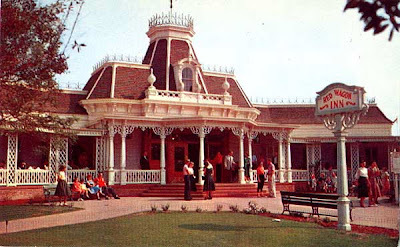 And finally, Chris Epting has posted another installment in his Disneyland series -- this time using some old photos from Daveland as a starting point. 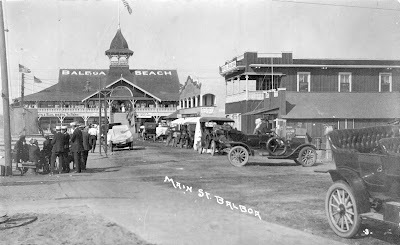 Here are two more postcard images of Balboa from the Orange County Archives' Tom Pulley Collection. 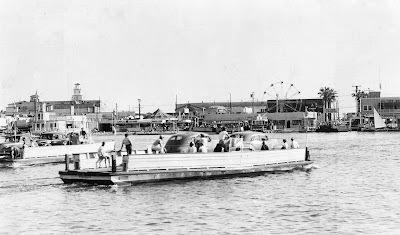 The image above shows the Balboa Ferry and the Fun Zone as they appeared in 1948. 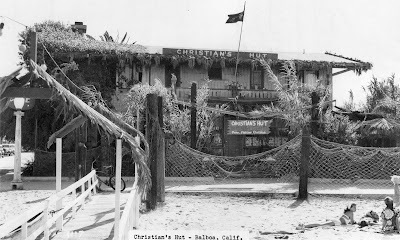 The image below shows the popular Christian's Hut bar and restaurant. Speaking of open houses, John Wayne's old yacht, the Wild Goose, will be open for tours in Newport Harbor this weekend. After years of work by Glenn Frank, the Buena Park Historical Society and others, the Dreger Clock, (once located at Knott's Berry Farm) will be dedicated at its new home, next to the historic Whitaker/Jaynes House. The ceremony will take place Oct. 3rd. For details see Glenn's website. My blog entries are usually driven by current events, by material suggested or sent to me by others, or by whatever strikes my fancy. There's no real plan. Accordingly, I occasionally notice that I've unfairly ignored certain communities. It just happens. For instance, it turns out I've only posted about five images San Clemente over the past three years. 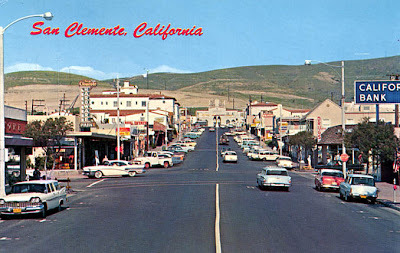 My mea culpa begins with the 1950s postcard of Downtown San Clemente posted above. 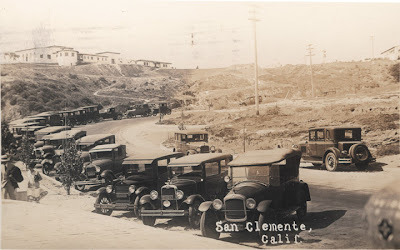 This next photo shows beach parking at San Clemente in about 1928. From my own childhood, I seem to remember a big dirt parking lot. Today the lot is paved, landscaped, and well-lighted. 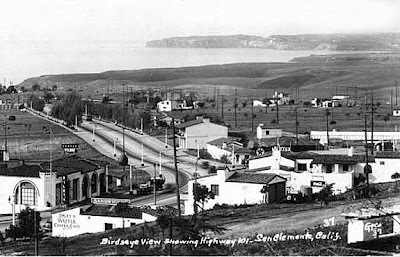 In the early days, developer Ole Hanson decreed that all buildings in San Clemente must conform to the town's slogan: "The Spanish Village of White Houses." Everything built was in a Spanish motif and featured white walls and red roofs. Perhaps you thought South County's planned communities and strict CC&Rs were something recent? 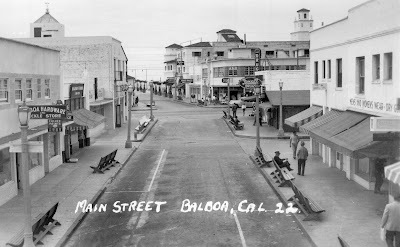 Today's images of Downtown Balboa come from Tom Pulley's amazing postcard collection. The first (top) is from sometime around the 1910s, and the second image is from World War II. Although much has changed, both views are still pretty recognizable today. 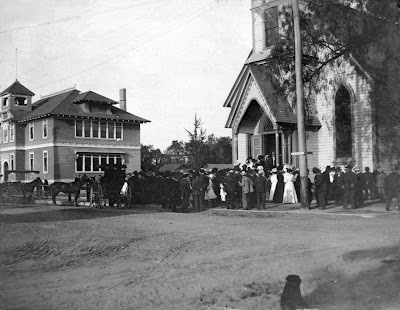 The Orange County Archives will hold a free Open House this Saturday, Sept. 26, 10am-4pm. The Archives are very rarely open on weekends. If you normally can't get in to do research during the week, this is your chance. "Behind the scenes" tours will be available. The Old Courthouse Museum (upstairs) and the Dr. Howe-Waffle House Museum (next door) will also be open that day and offering tours. These events are held in conjunction with Smithsonian Magazine's annual Museum Day. On Sunday at 2pm, the Anaheim Historical Society will hold their annual Ice Cream Social at the GardenWalk shopping center at 321 W. Katella Ave. The City of Anaheim's Heritage Services Manager, Jane Newell, will discuss the lives of Kate and Ella Rea, for whom Katella Avenue was named. Today's photo shows St. John's Lutheran Church and School on S. Olive St. in Orange. This church building was replaced with the current one (which is most impressive!) in 1914. Thanks to St. Johns' and Katie Schroeder for the photo. Francelia Goddard, librarian, college instructor, local (Santa Ana) historian, and widow of Allen W. Goddard, died Sept. 8 at age 102. Her obituary is posted online. The memorial service will be held at Waverly Chapel, 1700 Fairhaven Ave, Santa Ana, at noon on Sept. 26. The Newport Harbor High School bell tower and adjacent buildings -- recently demolished -- have now been rebuilt at a cost of $55.5 million. For that price, I'm sure they could have retrofitted the historic buildings instead of building replicas. The Laguna Beach lifeguard force is celebrating it's 80th anniversary. The White House Restaurant (1909) in Anaheim (which is on the National Register of Historic Places,) is planning to add another building between the historic structure and the street. Talk about old O.C. and new O.C. coming together,... Tustin's new Citrus Ranch Park features 1,000 lemon trees. (A wonderful and welcomed nod to our citrus heritage!) However, you won't be able to pick any because you might hurt yourself or damage the irrigation system. Presumably, the trees will be safely behind a tall fence. Joni Mitchell saw it coming: "They took all the trees, and put 'em in a tree museum. And they charged the people a dollar and a half to see 'em." Speaking of trees, those with an interest in Orange County's rustic past may be interested in the new exhibit at the Irvine Museum. It's always nice to see images of O.C. before we paved over most of it. The Irvine Museum often exhibits some really beautiful art -- and this is no exception. 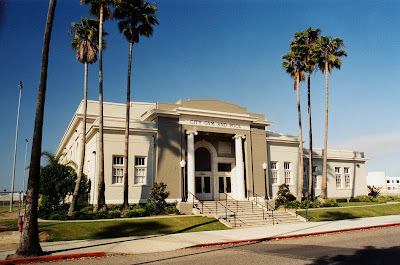 Marilyn Kalfus at the Register just posted an article about the need for historical preservation in Huntington Beach. (See if you recognize anyone.) There is talk of starting a non-profit preservation group in town -- Something akin to the Santa Ana Historical Preservation Society or the Old Towne Preservation Association in Orange. If you live or work in H.B. or care about the city's remaining historic resources and are interested in helping start such an organization, please send me an email. 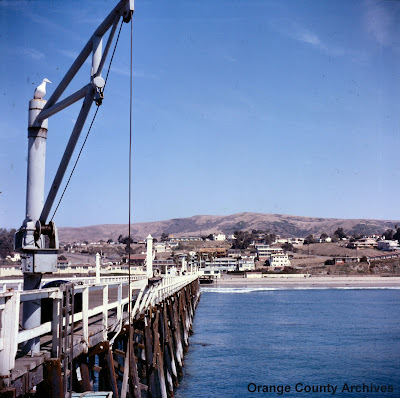 Today's photo comes from the Orange County Archives. It shows H.B. 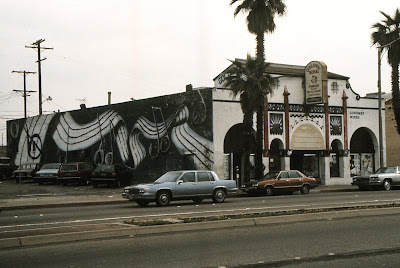 's iconic Golden Bear in 1986, just days before it was demolished to make way for a Subway sandwich shop and a frozen yogurt shop. Red Wagon Inn, Disneyland, Yesterland, DCA, etc. Here's an old postcard of the Red Wagon Inn at Disneyland in the 1950s. When the park opened in 1955, this was reputedly Walt Disney's favorite restaurant on the premises. It was operated by the Swift meat company. When Swift's lease ran out, the restaurant was redesigned as a buffet-service operation. It reopened under its current name, The Plaza Inn, in July 1965. About a year ago, Werner Weiss of Yesterland and I spent a whole day walking around Disney's California Adventure, taking photos of things we thought would soon "become history" during the park's planned (now current) overhaul. You can see the fruits of Werner's labors in his recent posts. Do you think future generations will actually morn the loss of the Whoopie Goldberg "Golden Dreams" attraction the same way we now look back wistfully on Tomorrowland's "Flying Saucers" ride? Blog Update: My computer continues to be a problem. I apologize for the scanty posts and for not getting back to your emails in a timely manner. The new machine should arrive next weekend. D23, Crystal Cove, Evangeline, Dana Point, etc. Welcome to everyone visiting us for the D23 convention in Anaheim this week. 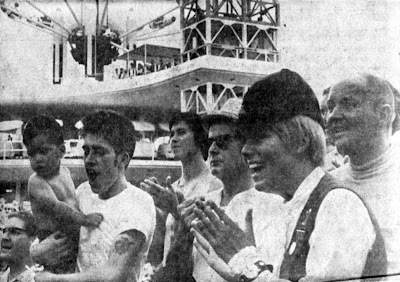 The photo above is from 40 years ago, and shows the reaction in Tomorrowland to Apollo 11's moon landing. Hundreds of people watched the landing on large TV monitors set up at Disneyland. The group shown in this photo includes Americans as well as the Russian Olympic track team and their tour guide. Interested in the historic cottages at Crystal Cove and their preservation/restoration? 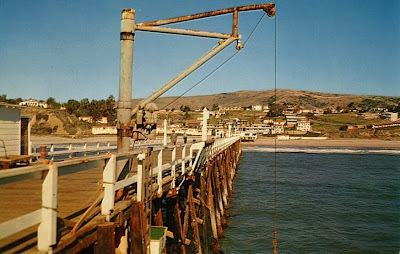 Laura Davick of the Crystal Cove Alliance will be the speaker at the Orange County Historical Society’s meeting, Thursday night (Sept. 10), 7:30pm, at Sherman Gardens, 2647 E. Pacific Coast Hwy, in Corona del Mar. The meeting will be preceded by an appetizer and dessert potluck at 6:30pm. (If you plan to attend the potluck, please bring a dessert or appetizer for six people.) In addition to the talk, there will be a follow-up tour of Crystal Cove on Sept. 12th. This two-hour walking trip is free, but parking at the State Park is $10 for the day. For information about the tour, contact Carolyn at ochsschoff@aol.com. Gordon Bricken’s new book, Pioneers in Blue and Gray, is now out. It expands on O.C.’s civil war heritage, offering biographies of local Civil War veterans. It retails for $35. Speaking of Civil War heritage, the historic Evangeline Hotel (1906) in Huntington Beach is once again up for sale. Read more about it in the Register. (I've blogged about this property before, including here and here.) This one's worth fighting for, folks. On Sept. 27, the Dana Point Historical Society will hold its annual Home Tour, as well as a a Hawaiian Luau and a Historic Tallship Tour. From 1-3pm, there will be a tour of two 1929 "Doheny homes" on the same block in Capistrano Beach. One of these homes was the home of artist Louise Leyden and a private collection of her paintings will be on display along with the original Roy C. Kelley plans for the house. The second home, just doors away, is a Spanish Colonial Revival home, currently undergoing restoration and featuring beautiful tile, inside and out, a wood trussed ceiling and the original hardware and doors. Both houses are on the Historic Register and this will be a self drive tour. From 2-5pm, a luau will take place at Doheny State Park, complete with surfing exhibits tracing the history of surfing from Hawaii to Dana Point. There will be a great feast, music, booths, vintage photographs and some "old school" surfers to "talk story" with. Serving begins at 3pm and will include all of the authentic luau trimmings. From 4-6pm, there will be a tour of the Curlew (1926), the 82' schooner moored in the Dana Point Harbor. Built in Maine she was a very successful racing boat before becoming a training ship during WWII. The DPHS is helping to achieve a listing on the Historic Register for the beautiful Curlew. The cost is $25 for all three events. For reservations, mail your check to the DPHS, P.O. Box 544, Dana Point, 92629 or call (949) 248-8121. Here are two images of the Huntington Beach City Gym & Pool. 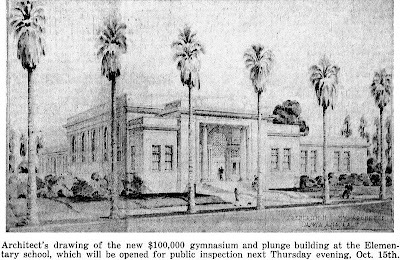 The first is the 1931 concept art by well-known Orange County architect Frederick Eley. The second in a photo I took a few years ago. The building has recently been restored and is one of the best examples of historical preservation by the city. The City of Huntington Beach currently has five vacancies on their Historic Resources Board. The Board's mission is to promote public awareness of local historic resources and act as an advisory capacity to the City Council on matters of historic significance. Applicants must be residents of Huntington Beach and be available to attend meetings every month. The current vacancies will be posted until filled. For more information regarding this volunteer position, contact Kate Hoffman at (714) 374-1658. Applications may be downloaded from the City’s website.